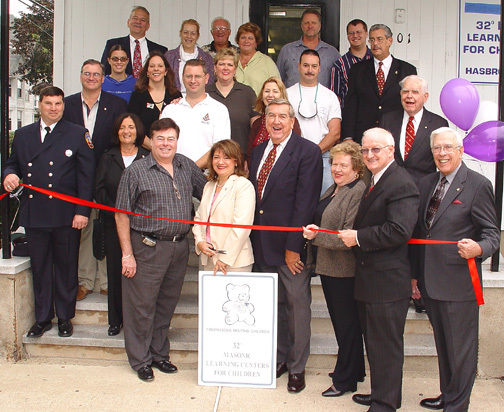 32 º Masonic Learning Center For Children held its ribbon cutting ceremony on Saturday, October 2, 2004. The center was then opened to the public for tours from 11 a.m. to 1:30 p.m. Light refreshments were served. The center is located at the site of the old Hasbrouck Heights Free Public Library at the corner of Division and Burton Ave. -- which after 80 years -- moved to new facilities at 320 Boulevard. Euclid Lodge #136, Free and Accepted Masons of NJ located at 200 Division Avenue & Boulevard requested from the Mayor and Council that the empty facility be used for this learning center. The generosity and spirit of Mr. Edward Black the donor of "little white house on the corner" was remembered. The Deed of gift from Mr. Black was crystal clear "the building was to be used for "educational purposes" if not, the building would revert back to the Black family. The Black family gave their permission for the change of use. During the opening ceremonies, members of the Lodge were recognized for donating the money and many hours in renovations to make the building suitable for this learning center. The Director of the Center is Maria Torres-Kimmins. This center is one of several in the State of New Jersey sponsored by the Masons and dedicated to serving students with dyslexia.